Trip Spector has spent years slowly going numb, drawing a comic he can’t stand for a man he wants badly, but can’t have. Aimless and highly allergic to pretty much everything, he knows he’s meant to do more with his life, but has no idea what that could possibly be until a chance encounter with a handsome zombie in the woods inspires him to take a chance for the first time in years. But, even the gorgeous, surprising special effects artist may not be enough to help Trip pursue his dreams when his worst habits come back to haunt him. Sampling his way through the judgmental, expiration date-obsessed NYC singles scene has left Silas Goolsby feeling empty and detached. But, when his missed opportunity with a shy, nerdy artist turns into an unexpected second chance, he knows he’ll have to leave all his familiar patterns behind if they want a future together that really matters. Moving on from his past isn’t easy, no matter how much he wants to, but giving his heart away could cost Silas more than he has to give. Trip and Silas are likely the most perfect couple that nearly weren’t that I’ve ever had the pleasure of reading. On the surface, they don’t have much in common except the artistic nature of their respective professions, and that they’re both gay. Beneath the surface, however, they share a nerd streak that won’t quit and an eager indulgence of their decidedly non-stereotypical sexual inclinations. Otherwise, they couldn’t be more different. Trip has more hang-ups than a dry cleaner, but, from the minute figures out that what Silas really needs is exactly what he’s been aching to give, he’s hooked. Silas, on the other hand, is honest, brazen, devoted, and doesn’t do anything halfway. They both know how the script they’re supposed to be acting out goes, and have lived it faithfully in the past. Once they find each other, however, they realize that they’re tired of playing along and begin to follow their hearts instead. Aside from the unlikely, yet fascinating, pairing of these two artists, Bad Idea is a slice of pure nerd heaven. Maybe Nerdvana. With bountiful pop culture references, heaps of artistic legend name-dropping, and a fearless skewering of “play it safe” industry risk-avoidance, this novel was a complete hoot to read. “The Tick” references alone were enough to have me merrily quoting along (and led to a weekend marathon of the TV series on Netflix), and the gleeful referencing of so many fandoms, both well known and obscure, was both comforting and highly enjoyable. Mr. Suede also has an undeniable talent for making his characters seem alive on the page. Both Trip and Silas had such clear voices that I had no trouble imagining the world Mr. Suede created for them and their roles in it. Whether through Trip’s staccato, sometimes inarticulate uncertainty, which more often made him seem like an artistic genius who is simply at a loss for words, or Silas’s passionate determination to help make his lover’s dreams come true, these two men drew me in from the beginning, and never let go. Mr. Suede gives a happy, yet meaningful, economy to Bad Idea, which goes beyond the settings and narration, and extending to the dialog, which I found to be as easy to hear as if it were spoken aloud. As much as I enjoyed the lighter aspects of the story, I was equally as heartbroken when things didn’t go as well for Trip and Silas. After several misunderstandings and near misses that resulted in a deepening of their relationship, a disastrous collision seemed unavoidable, and Mr. Suede didn’t spare anyone’s feelings. And, he was right not to. As much as I cringed at the thought of what I suspected might be coming, happen it did, and the carnage was every bit as heartbreaking as I’d been afraid it would be. It was both terrible and beautiful in the way good storytelling sometimes is, and I was unable to stop reading until I found out how the story ended. A sexually explicit novel as well just a good story, Bad Idea doesn’t try to be polite about the relationship Silas and Trip have. The two men are the answer to each other’s naughtiest prayers, and although he is initially tentative, it quickly becomes apparent that Trip is perfectly able to give Silas what he wants, as much as the other way around. The language is frank and the descriptions are vivid, but both serve to make each encounter work. Anything less than that level of veracity would have seemed false and broken the spell. Instead, the scenes maintained the feeling of transparency running throughout the story, making it easy to stay engaged in the narrative as a whole. 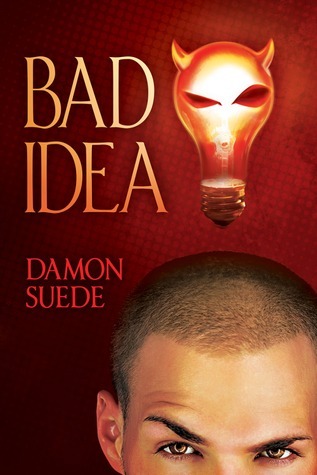 Bad Idea is the second novel I’ve read from Mr. Suede (the third being the first novel in the companion to the Itch series, Scratch—which I couldn’t resist buying after reading this story), and I had a great time reading it. From the characters to the in-jokes to the evolution of the various relationships in the story, I was able, and eager, to follow along wherever the narrative lead, easily believing that both main characters would somehow find their way to the perfect ending for them. Though Bad Idea certainly left me smiling, it’s clear that Trip and Silas (and Scratch) have more story to tell, and I’ll be waiting, though impatiently, for both. Bad Idea: Some mistakes are worth making. Reclusive comic book artist Trip Spector spends his life doodling supersquare, straitlaced superheroes, hiding from his fans, and crushing on his unattainable boss until he meets the dork of his dreams. Silas Goolsby is a rowdy FX makeup creator with a loveless love life and a secret streak of geek who yearns for unlikely rescues and a truly creative partnership. Against their better judgment, they fall victim to chemistry, and what starts as infatuation quickly grows tender and terrifying. With Silas’s help, Trip gambles his heart and his art on a rotten plan: sketching out Scratch, a “very graphic novel” that will either make his name or wreck his career. But even a smash can’t save their world if Trip retreats into his mild-mannered rut, leaving Silas to grapple with betrayal and emotions he can’t escape. What will it take for this dynamic duo to discover that heroes never play it safe?